In this guide we’ll take a look at the best solar garden lights for the UK market. What Is The Best Solar Garden Light? This set of six Ultra-Bright 15 Lumen Solar Garden Lights are the perfect LED lights to brighten up your garden or balcony. These are the best solar garden lights that are ideal for lining a path to help you see your way safely in the dark. Each light is positioned on a sturdy stake that you simply push into the ground. The solar panel is located on the top of each unit. Set up is completely hassle free, simply position them where you want them and once night falls they will turn on. They are also very durable and weather proof for year-round use. For best results, position these lights in a place that gets direct sunlight and they will then give you up to eight hours of night-time illumination. The lights are really bright and charge well even on days with some cloud – lasting well into the night. The brightness means they are great for lining a path, but also bright enough for you to see well when entertaining outdoors. Overall this is a fantastic value package of 6 super bright LED lights that includes a lifetime guarantee for your peace of mind! These are the best solar garden lights for the money! These Outdoor Torch Solar Garden Lights create a flickering flame like glow in your garden for enchanting evenings. They are the best solar garden lights if you are looking for a subtle and beautiful effect. The set includes two large lights that have the appearance of metal torch holders and they do look stunning when they illuminate at dusk. They charge well on a sunny day and even charge when it is cloudy, though they will not stay alight for as long after an overcast day. The lights have an IP65 waterproof rating meaning you can leave them out all year round. The solar panel is discreetly located on the top of each. These beautiful lights are perfect for creating an ambient glow in the garden, however, they are also bright enough to allow you to see your way along a path. These garden torches would look great all summer long and are also a nice feature in the cold months and as part of your Christmas lighting display. 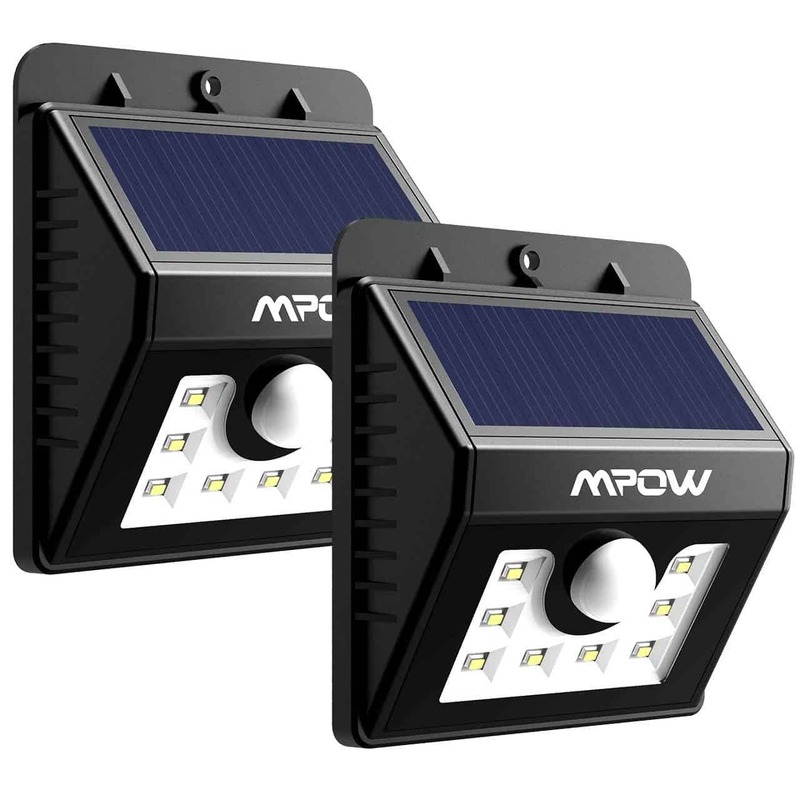 These Mpow Solar Powered Security Lights offer a great alternative to wiring in security lights. The pack comes with two LED lights which are really bright, comparing well with mains run equivalents. The units can be hung, or screw mounted, and they are well constructed with two separate seals to protect them from rain. The solar panel is on the top of each unit and is quite large, making for a powerful and long-lasting light. These lights have a range of settings. You can set them to dim, bright or motion sensor and there is also a setting that leaves them on dim all night, but they will switch to bright when they sense motion. The motion sensor will detect movement up to 26 feet away. On the dim setting, they last a good few hours as long as they get sufficient sunlight during the day. The motion sensor setting is excellent and will keep going all night. These Lantern Solar Powered Wall Lights With Motion Detection have a classic lantern design that make these the best solar lights for traditional houses as well as modern ones. The solar panel is discreetly integrated into the top of the lantern. The lights have a variety of settings including a motion sensor setting. The lamp gives off a warm glow that is reminiscent of a candle flame but also has a bright light that switches on when people pass close to the lamp. These bright and versatile lights have an IP65 waterproof rating and will last up to 10 hours when positioned in direct sunlight. Although these are on the pricier side, they are some of the best solar garden lights that provide a realistic flame effect as well as double as security lights. These Solar Powered LED Fairy String Lights With 8 Modes feature 200 bright LED lights on a 22-metre string. The warm white light effect makes these the best solar garden lights for creating an ambient glow around a seating area in the garden. The lights have a variety of modes including twinkling, flashing, waves and steady on. They charge fully in 5-6 hours of daylight, turn on automatically at night and give up to 15 hours of night time illumination after a full charge. The lights have an IP65 waterproof rating making them suitable for year-round use. The solar panel is separate from the unit, so you can easily position it in a nice sunny spot. These fairy lights create a bright glow in the garden and are wonderful when trailed along a fence or over a gazebo or summer house. These are the best solar garden lights for creating the perfect ambient glow for summer evenings and they also make a great outdoor Christmas decoration. If you are looking for something a little different from black plastic solar lights, these Glass Snowdrop Solar Powered Flower Lights look wonderful by day and night. The glass petalled snowdrop flowers are really delicate and beautiful and would look lovely in pots around the patio. The pack comes with two snowdrops and they are really quite bright at night. The solar panel is located on the stem of each flower. After a full day’s charge, they stay lit for up to 8 hours. These beautiful snowdrop lights add an enchantment to the garden both during the day and at night. These Solar Powered Garden Path Glass Bricks are another product that has a very attractive design. Each unit is crafted from a single piece of glass with an ice brick effect. Each block has four bright LED bulbs inside and these are some of the best solar garden lights for illuminating a path safely and with style. After a full day’s charge, these lights will last up to eight hours and they even perform pretty well after overcast days. They are perfect for lining paths or surrounding seating areas. The lights are beautiful and bright, and the sealed design makes them suitable for year-round use. The best solar garden lights are wonderful for creating an enchanting atmosphere in your garden. They also provide a lovely glow to welcome you home in your front garden. Solar lights can be used to line paths, too, you can see your way safely in the dark. In the past, wiring a set of garden lights was a costly hassle, but solar lights provide a wonderful fuss free alternative. And as solar technology develops, these lights just get better and better. You can buy solar lights in a host of styles and for a range of uses from the soft flicker of a flame effect to security lights with motion sensors. The best solar garden lights are a hassle-free way to illuminate your garden in a variety of ways from creating an ambient glow to improving safety and security. Lights with large solar panels are generally brighter and last longer. This means units with separate panels are generally brighter than those with built in panels. For best results place the lights or the panel in direct sunlight for as much of the day as possible. If you want your lights to be positioned in a shady area, then choose a set with a separate panel – you can then place this in the sun and still have illumination at night in the area that does not receive much sun. Alternatively, you could put stake-type lights with integrated panels in pots and move them into the sun during the day and back to the required location at night. While many solar lights will provide illumination for most of the night, this will depend on how much sunlight they receive, so don’t rely on them to last all night after cloudy days. What maintenance do my solar garden lights require? The only maintenance your lights will generally need is a wipe over the solar panel occasionally to remove any grime. This will make them charge more effectively in sunlight. Some solar garden lights also have batteries that can be replaced when they reach the end of their life and no longer hold a charge.